Description TAD consists of an Active Server Page web interface to a relational SQL database that automates tissue microarray recording scores and linking them with clinical data for future interpretation. Tissue microarrays are increasingly important tools that bring high-throughput technology to traditional pathology laboratories. In many cases, each spot on a tissue microarray is scored by a skilled pathologist and recorded manually. 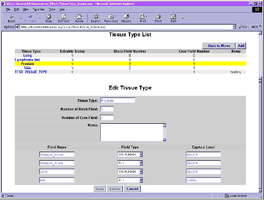 The Tissue Array Database project is a web interface that automates recording scores and linking them with clinical data for future interpretation. The project consists of a web-based front-end application and a back-end relational database. The web-based application provides the investigators, technicians, and nurses with integrated access to the database over the Intranet. They can easily enter, edit and retrieve and visualize the array and slide data through their web browsers. And it is also planned to interface with the third party image software, so that it integrates the tissue array information with the actual image of the slide. The relational database provides a mechanism to facilitate sharing of data while maintaining data integrity and security. It also consolidates and organizes the data such that data can be easily retrieved, analyzed and used to support the studies. The database will be a central data repository for tissue array studies. It will contain patient id so that the information on this database can be linked to other databases. It contains blocks and cores information that make out of each tissue array. It categorizes blocks and arrays by tissue types, projects. It stores slides information that are cut from the array, and the score that investigators give for each slide. It is planned to link each spot of a slide to the image files generated from the third party software by using the API (Application Programming Interface) provided by the third party. The easily access web-based application will provide user with friendly user interfaces and entry validation function. It includes those functionalities such as: enter/edit new tissue types, projects, blocks, arrays, slides. Once an array is created, user can visualize the array and edit each replicates or cut the array into slides and grade the slide visually. The database will be in a Microsoft SQL Server 2000 on a dedicated Windows 2000 server (BiostatSQL, Pentium III with 512 MB RAM and 33 GB hard disk space and located in the Department of Biostatistics on the 2nd Floor of the Faculty Center). The web-based front-end application will be developed in Active Server Pages, and will be running in Internet Information Services (IIS) on a different, but similar computer located in Biostatistics (ACCG, Pentium III with 1 GB RAM and 17 GB hard disk space). It will support major browsers (Microsoft’s Internet Explorer version 5.5 and above is recommended). To start using TAD, download the zip file, unzip it, and follow the installation instructions. TAD consists of two parts: an SQL back end and an ASP front end. If you can read this file, then you have probably successfuly unzipped the source code. To install the software, you need a SQL server to create the database and a web server (such as IIS) that runs ASP to create the interface. (a) Connect to a SQL server as a system administraton (because you are going to create a database and users). You may need to use a SQL client tool such as SQL Query Analyzer. (b) After you connect to a SQL server, open the file “TissueArray_Database.txt” contained in the SQL_Script directory, and execute it (click “run”). The script should create the database and all the tables. It will insert a small amount of data into the tables, including a single user called “ta_user” and some marker data in the “marker_def” table. (a) Open ODBC data source control, define a data source named “TissueArray”, choosing the SQL driver for the connection. 3. Install the ASP pages where your web server can find them. where “hostname” is localhost or the name of the machine that runs IIS. 4. Open your web browser, point it to the correct location, and login to the application as “ta_use\” to test the application. To give you a better idea of how TAD works, we have prepared a PowerPoint presentation containing a series of screen shots of the program in action.